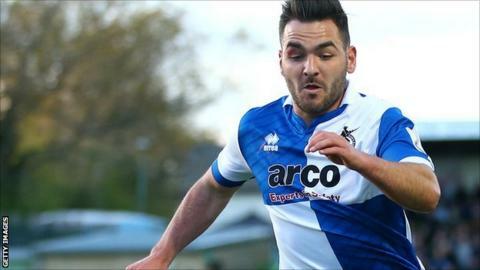 Bristol Rovers midfielder Jake Gosling says he want to replicate his international form at club level. Last month Gosling, whose father was born in Gibraltar, became the first man to score more than once for the team at international level. He made his second league start for Rovers in Tuesday's 3-0 victory over Hartlepool and the 22-year-old hopes it can kick start his and Rovers' season. "I'm proud to represent Gibraltar, but my job is here," he told BBC Bristol. Gosling, who came through Exeter's academy added: "I'm always fighting to do well and keep my job. I always want to do well for Bristol Rovers." Rovers were promoted to League Two in the summer and have had a mixed start to the new season winning four of their opening 10 games, losing five. And Gosling admitted he had noticed a difference in quality from the National League but was hopeful Tuesday's victory could provide a vital incentive. "There is definitely a step up," he said. "Your top teams like Portsmouth and Leyton Orient, you can tell the difference but I just think the organisation in League Two is a lot stricter. They stay in shape, there is a difference. He added: "Results haven't gone our way but we need to kick on now."